Discover all the latest about our products, technology, and SLTL culture on our news. 13th October 2018, SLTL Group hosted award ceremony for Web-O-Hunt contest at Gandhinagar, Head Office. The month long contest was held between 10 August and 10 September and saw tremendous participation from all across the globe. SLTL Group launched the contest under its rebranding strategy and invited participants from all across the globe. In this contest participants were asked rigorous question to which the answers could be hunted by conducting in-depth search of the website. Web-O-Hunt was a 4 week; week by week contest. Every week the contest process was refreshed and invited fresh participants, bringing in the fresh possibilities for participants to win the contest. The contest was divided into 4 categories to allow participants from varied backgrounds including: Existing customers, Vendors & Employees, Students and SLTL Employees. During, its month long run and 4 week cycles the contest saw international participation from over 6 countries and marked 15000 impressions worldwide. We received over 350 participant entries out of which 16 individuals came through. During the award ceremony, the winners were invited by SLTL Group at their headquarters in Gandhinagar, where they were given the introduction and tour to the one in class laser technology manufacturing facility. The tour let winners to look into largest laser manufacturing facility. The ceremony was was charmed by series of cultural dance performances by SLTL team members. The awards were facilitated by Mr. Maulik Patel Group’s Executive Director. The award ceremony was concluded with Grand Navratri Garba Celebration. 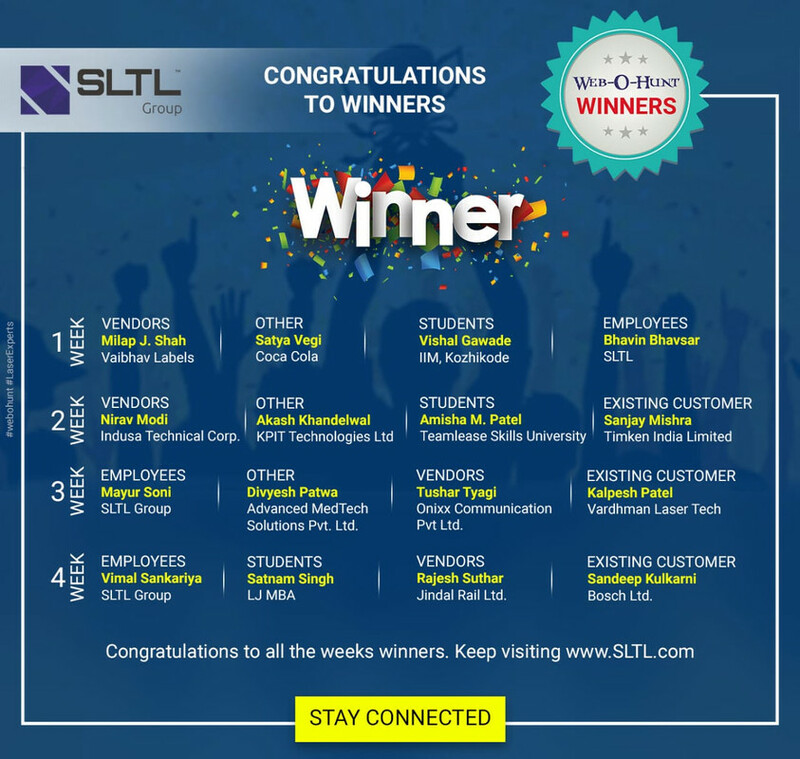 SLTL Group regularly conducts such contests as a way to communicate with stakeholders and an extension to convey thanks to stakeholders.